Are you sure it’s a swarm? 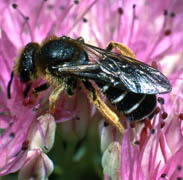 Honey bees swarm from April to July. Swarming is the natural way a honey bee colony divides to produce two colonies. About half the number of bees in the colony leave with the queen honey bee and look for a new home. The remaining bees stay in the old hive with a brand new queen. The process secures the survival of the colony which gets a young queen in replacing her ageing mother. Beekeepers try to prevent their colonies swarming for a variety of reasons. 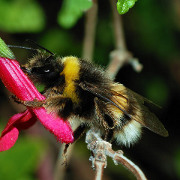 For one thing, swarming depletes their stock of bees and reduces the honey crop. A swam starts by consuming as much honey as it can for setting up the new home. 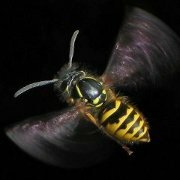 Swarms can also settle where they are not wanted, such as in domestic buildings. 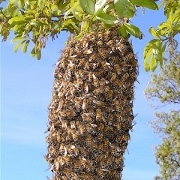 A swarm can consist of many thousands of bees. 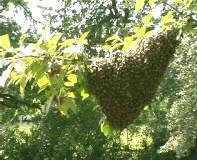 Once it issues from the hive, it usually settles on a branch or post not far away and forms a cluster. Somewhere in the cluster will be the queen. She gives off scent substances called pheromones, which have the effect of holding the cluster together. While the swarm remains in a cluster, scout bees search for a suitable new home. When a new home is found, the swarm will move off and take up residence. The swarm can remain in its cluster for anything between a couple of hours or a few days. What to do if you see a swarm, or have one in your garden. Don’t panic! 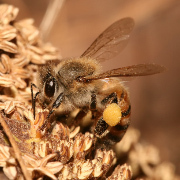 Honey bees sting when they are protecting their nest or they are frightened. In addition honey bees in a swarm have gorged themselves on honey prior to leaving the hive and thus they physically can not bend their abdomens sufficiently to sting. It is therefore extremely unlikely that you will be stung by bees in a swarm. However, to avoid any risk leave the bees alone. Don’t try poking them with sticks, throwing stones at them, or lighting fires under them in the hope of moving them. When the swarm has settled, contact us. To find a local swarm collector, enter your postcode on the BBKA Website, and the nearest local beekeepers will be listed. Provided the swarm has settled in an accessible place a beekeeper should be able to capture the swarm and introduce it to a new hive. This is a voluntary service and the beekeeper may ask for recompense for any costs incurred, e.g., travel expenses in collecting the swarm. Please be aware that beekeepers will be unable to collect swarms that are in inaccessible places such as the top of trees, in a chimney, inside cavity walls etc and that they will only collect honey bee swarms. 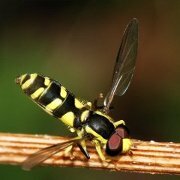 For inaccessible swarms, wasps and hornets and other insects you will need to contact pest control people who will charge for the service, though some councils provide these services. Taking in swarms helps us in our effort to control the spread of honey bee diseases. 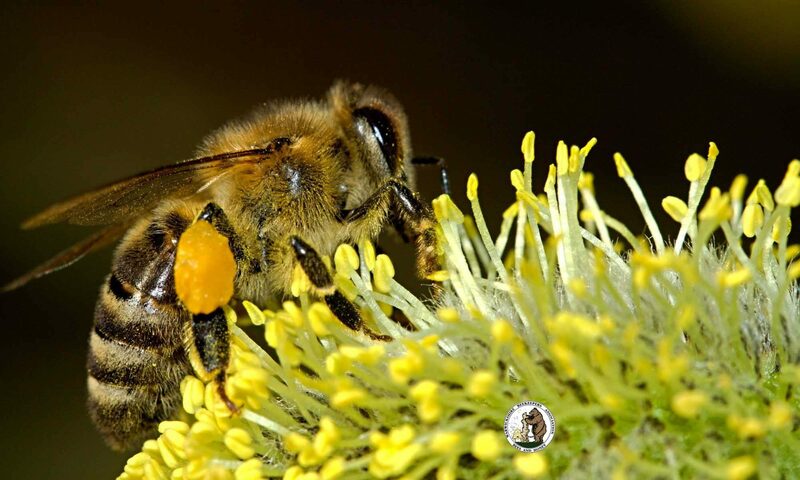 It also helps us control the reproduction of less desirable genetic traits in honey bees. Also, swarms are given to any new member beekeeper waiting with a brand new hive ready for its first occupants.